Like Osborne Village, it contains a diverse mix of homes and street-level businesses. It offers relief from the bleakness of much of the rest of the city, where residences and commerce are kept strictly separate. When there’s only one reason to go to a neighbourhood, it tends to be quiet, but it’s also boring. When a neighbourhood attracts a variety of people at different times of the day, it’s lively and interesting. The colourful mix also makes it controversial, because there are a lot of potential conflicts between commerce and residence. The people who live there probably chose the neighbourhood in part because they like the liveliness, and the proximity of some of the businesses they patronize. At the same time, a street with foot traffic is a good place to invest in street-level business. The growth of a neighbourhood that is attractive to both businesses and residents sets up a precarious balance: Too much business and the neighbourhood becomes too noisy and crowded for many of its residents; too many apartment towers and the street becomes less attractive to walkers and patio-sitters. In order to manage the growth of Corydon Village, Winnipeg’s decision-makers have to do something they’re really bad at: create a forum for the airing of conflicting interests and mediation of those interests, while ensuring the continued viability and attractiveness of the neighbourhood. 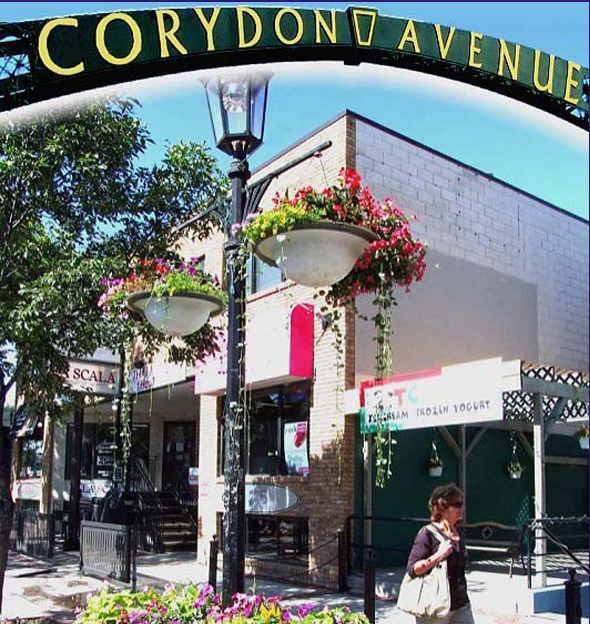 c. “Moderate”, meaning the city allows some selective development of duplexes and high-rise residential towers, and some further growth of business, while ensuring that Corydon Avenue remains a pleasant place to walk or while away an hour on a patio. That wouldn’t be hard to do, but it would require city planning officials to devote some time to thinking the scenarios through and producing pamphlets, web pages, or brochures. Given that the city has, in recent years, cut its city planning staff to the bone, it’s hardly surprising that the city’s Corydon-Osborne Neighbourhood Plan web page offers nothing more than some generalities about drinking establishments and descriptions of the neighbourhood. The second feature of participation-friendly development is openness to public input. Here the city also falls short. In terms of secretiveness and defensiveness toward the public, it appears to be trying to rival the Kremlin. In the case of most development decisions, its approach to public input is limited to “open houses”, displays of decisions already made in a manner well-calculated to insult the public’s intelligence. It wouldn’t be hard for the city to establish a workable and open decision-making process for Corydon Avenue, but it would require some modest resources and, more significantly, the eradication of some deeply-rooted bad habits. This entry was posted in City politics, City Politics: Issues, Urban growth and development, What's wrong with the way our communities are governed, Winnipeg Free Press, Winnipeg politics, Winnipeg: Growth and development and tagged city planning, Corydon neighbourhood, Osborne-Corydon, public participation, urban development, Winnipeg. Bookmark the permalink. I read your blog about corydon and wanted to pass on a few of my thoughts. You make some good points about planning and about issues and approaches that could be taken on Corydon. I agree the facebook page for the previous incarnation of the plan is poor. However…what actually happened with the planning work that was going on was ..a lot of very good work was in process. If you talk with the many people who participated…it wasn’t not the usual “open house”…there were design workshopss, a variety of meetings, neighbourhood walkabouts and other methods that were facilitated by Dudley Thompson among others..
No process is perfect but it was pretty darn good and a lot of good work was done…The plan hadn’t even been drafted yet when….all work was stopped in a bizarre power play by a small group of property owners/businesses supported by Russ Wyatt & Jeff Browaty. The biggest issue is that a small group of powerful property owners have been able to stop a planning process and then are currently stopping it from being started again…even though council voted for $100,000 of resources to go into it restarting the process again. You are right that resources are scarce…that is why it took so many years to get this work really going in 2011…planning dept finally made it a top focus…only to have it stopped by Russ Wyatt Jeff Browaty. Now they (and these two property owners) are stopping it again. If you haven’t seen my enewsletter …it tries to shed light on what has been happening. We are also having a town hall meeting this week on Thursday May 16th at Lav at 7 to discuss what to do next. There has been very poor media coverage of this…and it is very tough to get the truth out…hence my wish to let you know more about the whole story.. The RPARC web site (http://rparc.wordpress.com/2013/05/13/246/), which quoted part of my blog post, has other material of interest.